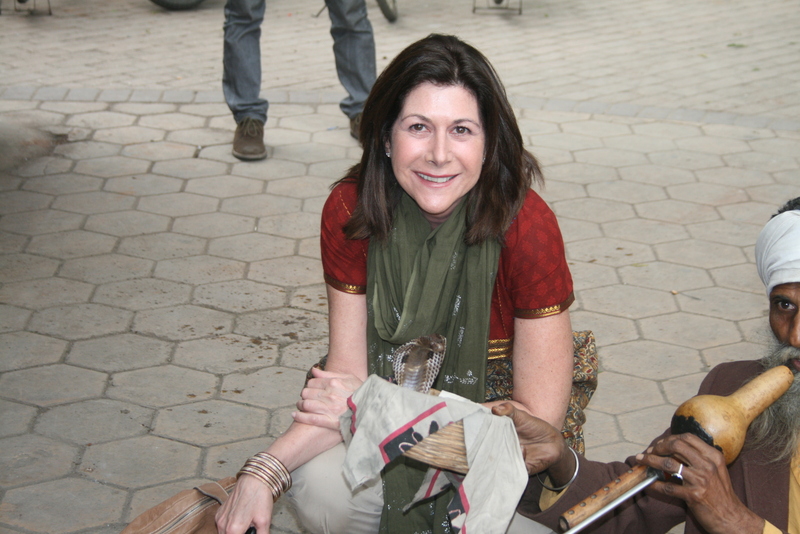 Arriving in Delhi I immediately am “homesick” for Kolkata. Though both are big cities, Kolkata exudes a warmth and sense of belonging – community – and Delhi seems to be a bustling, busy and somewhat impersonal place. A kind face is waiting for me at the airport, so I relax a little and settle in for the ride to the hotel. Culture shock! I have stayed in Kolkata for 7 weeks and at the school living with the children, but I am not prepared for this hotel, just off the road in the middle of nowhere. I am told not to leave the hotel as it is not safe for a woman at any time in this location. Welcome to Delhi. Not very happy, I retreat to my room which is the size of a closet and dark. What to do? I grab a guide book and hire the car to take me to the Hyatt for dinner, where I have a great meal and feel more comfortable. Tomorrow is a big day filled with tons of sightseeing and I decide to just give in and get some sleep. Up early for breakfast and to meet my guide, the staff is friendly and very curious about where I come from , where I’m going. 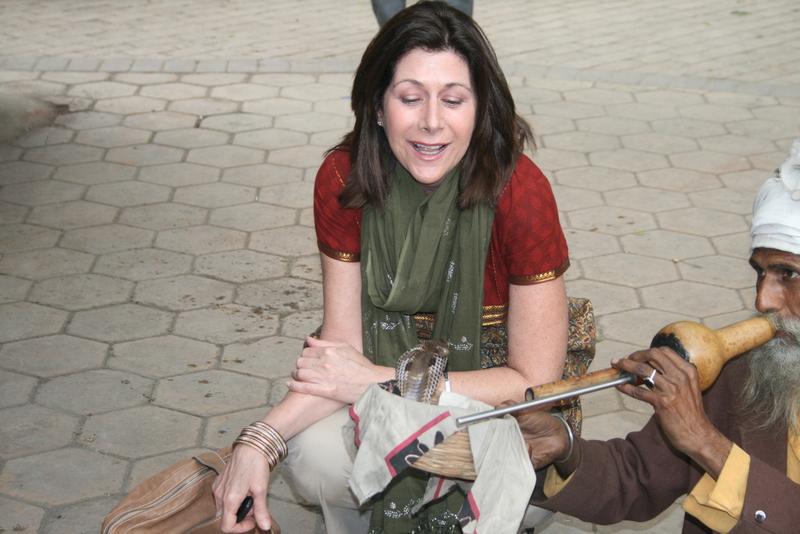 This is common in India, most people are very friendly and love to talk to foreigners. The food is actually good, so I’m then off to the car and the waiting guide who’s name is Ishwar. He is a young man and speaks many languages, we hit it off right away and begin the tour. 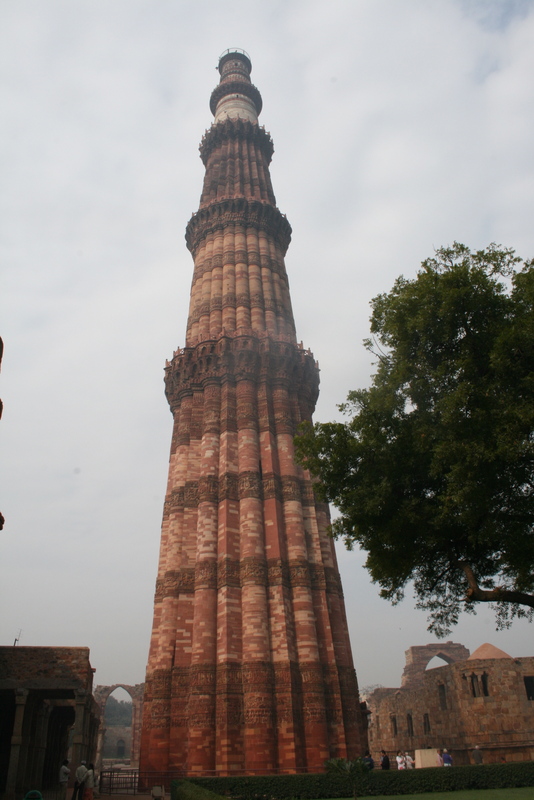 First is the Qutub Minar, the tallest tower in India, built by a Muslim man in his honor and to show his importance. 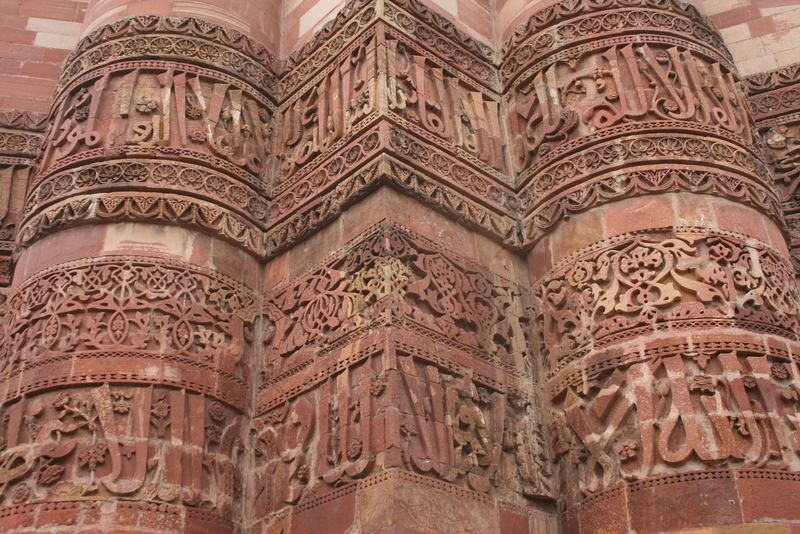 The buildings are beautiful and the stones are magnificent, but as Ishwar points out, the towers not only contain the writing and decorations of the Koran, many of the beautiful scroll like designs are Hindi, from temples raided by this man to enhance the beauty of his own creation. It is hard to understand the logic, but I am not to judge and the difficulties between the Hindu and Muslim people for thousands of centuries cannot be changed. 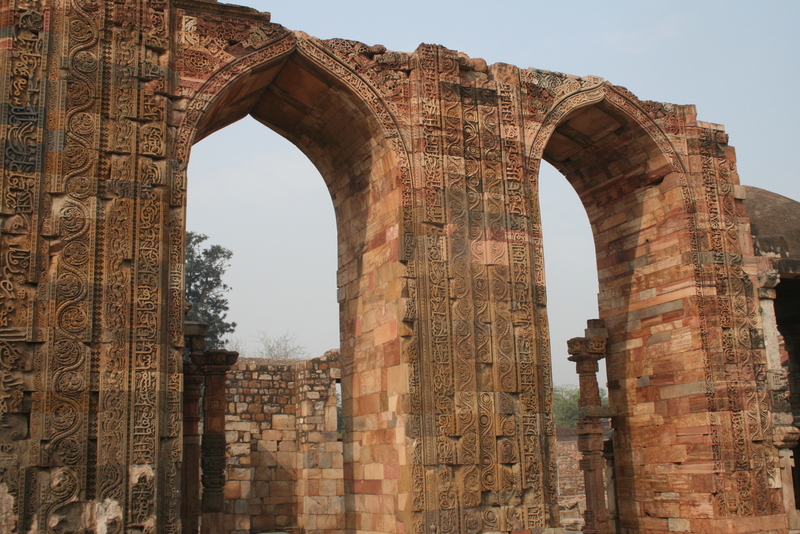 I accept it for what it is and we are then on to the next sights – the India Gate which was built to honor the Indian men who lost their lives serving in the army during World War I and the Raj Ghat which houses the tombs of Mahatma and Indira Ghandi. 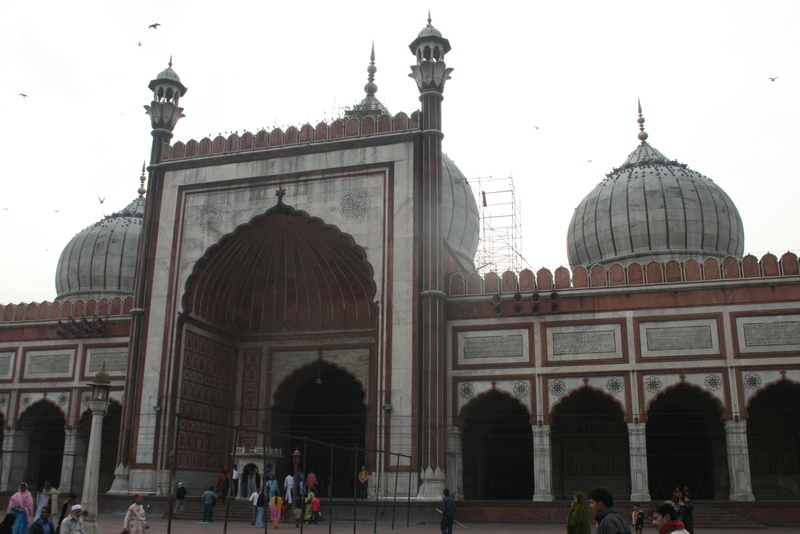 Next is the Red Fort (beautiful and massive), Jama Masjid , a beautiful Muslim Mosque. 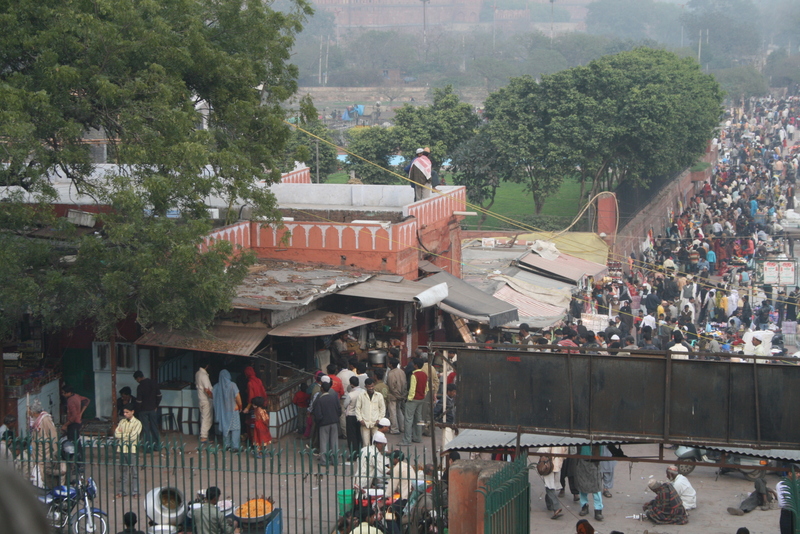 From the top of the Mosque, we can look down upon the Old Delhi market which was once a shopping area for only woman, as tradition had the woman and men separated. It is buzzing and Iswhar and I descend the steps to walk around and have some masala chai. Next is Rashtrapati Bhavan which is the President’s house and is amazing in it’s architecture and beauty. It is surrounded by Parliament and Commerce buildings and reminds me a little of Washington DC in its location and layout. Highlight of the day: Ishwar has noticed that I am a spiritual person, and dedicated to community service, so he has a surprise for me. We enter Bangla Shahib, a Sikh Temple, grand and welcoming. We must take our shoes off and he must cover his head as do all the Westerners. I am wearing my salwar kameez and have my chunni which covers my head and arms, so I have no problems! This religion is dedicated to community service as an act of godliness in every day practice. Those who run the various parts of the temple take no compensation as they feel it is a privilege to serve God in any way. The rooms are large and beautiful with chanting and prayers going on continuously. One must wash their hands and face before and after entering as an act of purifying oneself in the sight of God. Ishwar ushers me into another room, a huge marble banquet hall, completely bare but spotless and he explains that at lunch time, anyone from anywhere- regardless of race, social or economic status, religion, country of origin may have a complete meal prepared in a gigantic kitchen by workers who are there to serve God as well. Again, no compensation other than a feeling of goodwill. We are invited into the kitchen and huge vats of vegetables, daal (yum!) and massive amounts of roti are being made by about 100 people. They smile and ask me to sit at a tiny work table – the bench is hopelessly low to the ground and I must be twice if not three times the height of most of them, so it s a challenge and a great feat when I do sit legs crossed. I am shown how to roll the dough for the roti, and after being corrected a few times by a very kind (and patient ) woman, I get the hang of it and am really on a roll (no pun intended) when I realize that I have produced about 10 to their 50 , so I thank them and they ask me to take a few pictures which of course delights me. I leave there in peace and remark that this religion is one that should be emulated. 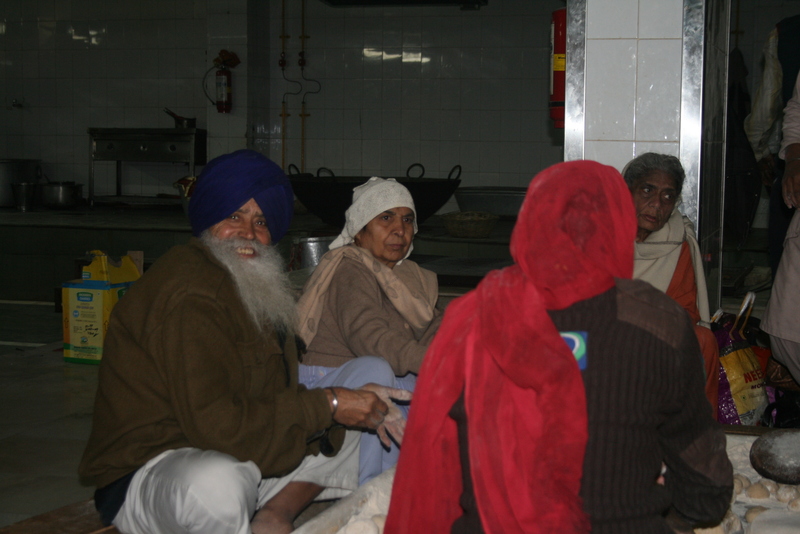 Ishwar tells me that only 7% of the population is Sikh – what a shame. As we leave the temple, he instructs me to cover my right hand over my left in a cup like position to accept a sweet offering to eat as a way to send one off with good thoughts for the day. At the very end of the day, we have one more stop and that is at a workshop taught by a master Kashmir weaver. Only Kashmir family members are working at this craft which is the most intricate of all. The rugs they produce can take more than 2 years to weave. 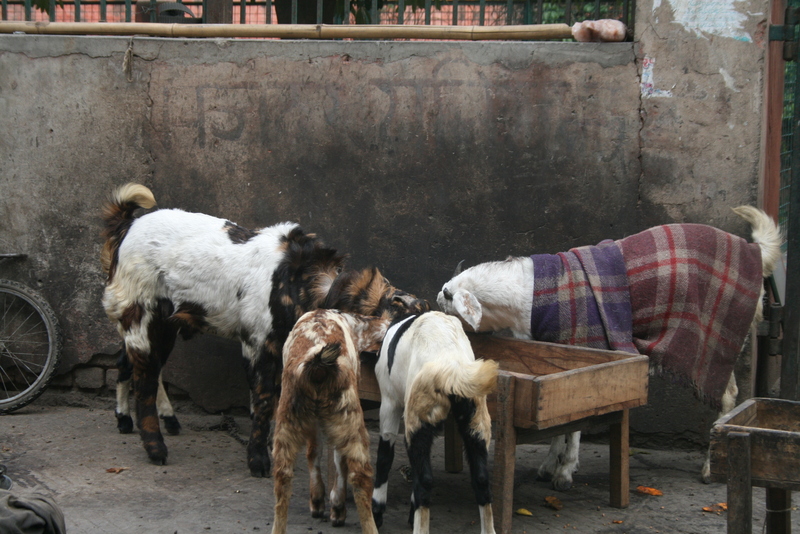 The fur from only a certain part of the goat is used and must be collected, not shaven, from where it has shed in the woods. Once collected by the nimble fingers of the women, it is died to the palette specifications of the chief designer, usually the head of the family. He then draws the design and drafts in onto graph paper, line by line, it is so mathematical. 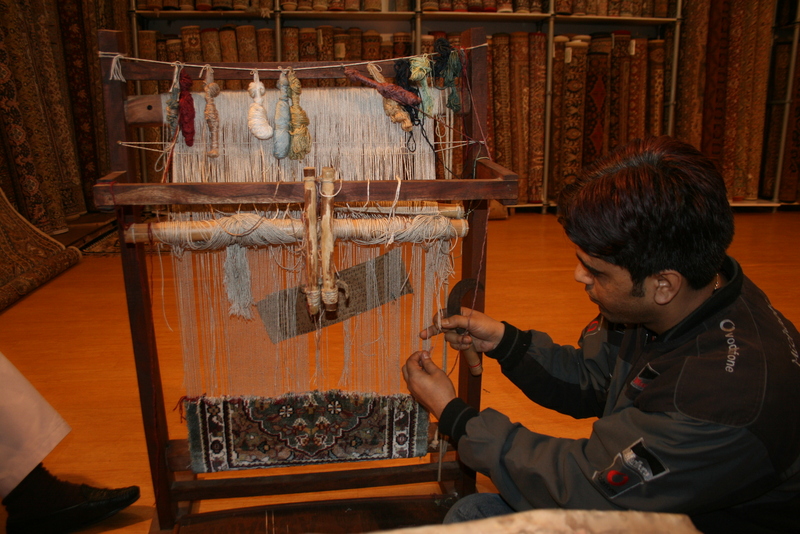 Then the wool is woven and died according to his notes which are handwritten for each line of the design of the rug! One line can be done in a week, not any faster, and then once it is complete, the threads are shaven and the process continues. All of this work is kept solely by the family so that the design cannot be duplicated. Depending on the intricacy of the work, over 900 knots per square inch (!) are made, the end result being rugs of many sizes. We look at the different weaves and knots per sq. inch and I sit on the rugs having a cup of chai, it is luxurious and I am hypnotized by this kindly old professor – he smiles lovingly at the rugs as he explains the process. I’ve just had a two hour workshop and am in heaven, I feel that today I have accomplished a lot. and am so thankful to my guide. We are to go to Agra tomorrow to see the Taj Mahal, and Ishwar is not supposed to come, but I ask him to since he is so knowledgeable and I will feel more comfortable having another man with me as I travel alone in the car. We agree on the time and go our separate ways for dinner. Thank you for your can be of help! I can’t figure out how to subscribe to the comments via RSS . I want to keep on top of this, how do I do that?